Although Hucclecote is today but an outlying ward of the City of Gloucester it used to be a southerly fragment of Churchdown when the original Cottage Meeting was started at Yew Tree Cottage. Now there are still green fields of Gloucestershire visible on the skyline despite the over-shadowing intrusion of the M5 Motorway. There have always been people deeply devoted to local Methodism over many years who have been also closely attached to the land. The Majority of the information below is taken from `The Diary of a Church` by Gordon Cowcher - a past member of the church. Richard Colwell, a Master Cooper in Gloucester, but a recruit from the Wesleyan cause at Hartpury, moved to Hucclecote, then a small hamlet of Churchdown in 1838, and started a Cottage Meeting, with the approval of the Superintendent of Gloucester Circuit, at Yew Tree Cottage, on the main Hucclecote Road, opposite the present Porchester Road. This was a time of great advance in village Methodism when a number of chapels were erected in the Gloucester rural area. It is a tribute to Richard`s powers of persuasion, passed down to succeeding generations, that he was able to stir sufficient local support, and substantial backing from fellow Wesleyans engaged in business in Gloucester, within 10 years for the first Chapel to be built in Hucclecote. The site, part of the small burial ground opposite Hillview Road, and near to Yew Tree Cottage, is where the original opening took place on the 4th October 1848 and this solid stone building continued to be used for worship for 80 years. The first Sunday School was started in a thatched half timbered cottage, long since demolished, which stood at the entrance to Chosen Way, and has been replaced by a grass plot studded with young trees. As Centenary celebrations took place in 1947 it appears that School or Junior Church has been maintained under Methodist supervision in Hucclecote, Sunday by Sunday, for upwards of 130 years, its influence incalculable over many young people , even though they "ceased to meet" whilst still of school age. Soon after the Chapel was built by Wm. Wingate of Gloucester, Thos. Gaze of Hucclecote, also a member of the building trade, became Superintendent of the Sunday School, a call he followed for Upwards of 30 years. Shortly after his death, his brother, Edwin who was not a Methodist, caused the premises opposite Conway Road to be built in his memory, as the Thomas Gaze Memorial Hall, and the stone laying ceremony on 6th September 1888 was shared between three staunch Nonconformists from Gloucester. This Hall was first in use just over 40 years after the opening of the Wesleyan Chapel, and was better known as the Wesleyan Methodist Sunday School for well over 40 years until Methodist Union, and almost as long a period until the opening of the present School Hall in Carisbrooke Road, by which time the "Wesleyan" title was ancient history. Today it still performs an important service to the local community. Soon after the Trust of 1889 was set up there appears to have been a demand for extension of the original Chapel and in 1908, Chapel Cottages, and agricultural land, classified as a Smallholding, was purchased (with the intention of enlarging both the place of worship and adjoining burial ground at the rear of the existing site) for £400. Although this extension remained in prospect for nearly 20 years there were difficulties with the tenancy of the holding, which eventually became derelict, and the rear wall of the demolished cottage is now incorporated in the rear boundary of the Burial Ground. The spare land which possessed inadequate access from Hucclecote Road, was sold in 1960 for £1,750 and the net proceeds were incorporated in the Building Fund for the present School Hall in Carisbrooke Road. Active planning for a new place of worship had been in progress for some 10 years before the desired site was purchased and actual building commenced, after 15 tenders had been considered. Mr. Wm. Leah was the architect and Messrs. Gorton & Shapcott of Gloucester, the main contractors at £3,220 for structure and certain furnishings, the official opening taking place on 14th November 1929. The local community had witnessed great changes over the 40 years of gradual preparation for this project, made urgent in 1928 when the main roof of the old Chapel was reported unsafe, and Sunday worship was transferred, temporarily, to the Sunday School building, opposite Conway Road. It is worthy of record that two brides, with sentimental attachment for the old roof beetling overhead, obtained special dispensation to face the future with their respective partners, even though Hucclecote Wesleyan Methodist Chapel 1848 was already out of bounds for Sunday services. By a coincidence, although this hazard was safely passed, fire interrupted morning service at the Sunday School on 23rd June 1929 - the only time that the congregation was virtually driven out - to face the traffic of Hucclecote Road before the opening of the Barnwood By-Pass. Local traffic in 1889 went on foot or by horse, only the youthful and adventurous sported bicycles. The original Sunday School saw a weekly assembly of teaching staff and scholars to the capacity of the hall and its later extension in 1912, when gas was first installed. In 1901 Richard Colwell from Hartpury, died at Hucclecote aged 91, but his eldest son, John, had predeceased him in 1887, aged only 47, and, in a bronze tablet in the south transept of the present church, he has been commemorated by his four sons, Ernest, who became a Minister in the Methodist Episcopal Church of the U.S.A. and Joseph, John and Richard, who became Ministers of the British Wesleyan Methodist Church. This quite exceptional tribute to the power of Methodism in this Colwell family from Hucclecote in the first, and most probably, the last purely personal memorial in the new Church. Following their Father, Richard Colwell Senior, in this work at Hucclecote were Richard and William, both of whom, having taken an active part in the business life of Gloucester, latterly made their homes within walking distance of the beloved Chapel. The present buildings in Carisbrooke Road have been erected on a site previously owned by William Colwell. He laid the foundation stone of the annexe to the old Sunday School and was the prime mover in starting the new Chapel Building Fund. Also, at Hucclecote he gave many years of unstinted service as Trust Treasurer and Class Leader, as Local Preacher in the Gloucester Circuit and as Councillor, then Alderman in the City of Gloucester, he continued in office to the time of his death in 1925 aged 80. But the longest serving member of this devoted dynasty was probably William Colwell the younger, affectionately known by his family and throughout the Gloucester Circuit as "W.K. ", eldest son of Richard the younger. Before the dawn of the twentieth century he walked or cycled, as a young man from Southgate Street, Gloucester, to play the organ at Hucclecote Chapel, opposite Hillview Road, and after moving to reside at Hucclecote continued playing there, and at Carisbrooke Road until 1946, approximately 57 years. It was a tribute to the growth of the Society of Methodists at Hucclecote that in 1915 the first resident Minister was appointed, and the Circuit took over the tenancy of "Nethercliffe", now 120, Hucclecote Road from Wm. Colwell Snr. and continued to rent it from members of his family for many years until able to purchase on advantageous terms, as sitting tenants. Before the end of 1927 an up-to-date statement of the New Chapel Fund had been circulated to all interested, with Promise Forms inviting gifts, and the Rev. Raynes threw his abundant energy, and oratory, into the task of organising the actual erection and opening of the building in Carisbrooke Road. In fact he applied to the Stationing Committee of Conference for an additional term at Hucclecote, beyond the 3 years then customary, thus avoiding any change of leadership at a critical stage, and himself prepared a book, to be a permanent record of the opening ceremony, and which, in itself, is a very worthy memento. On 21st May 1929, after many months of committees and sub-committees, both at Hucclecote and in Gloucester, a ceremonial stone-laying took place, involving dedications made personally and by way of memorial, coupled with appropriate contributions to the Building Fund. These proceedings were faithfully recorded on a bronze tablet erected in the North Transept of the Church, and unveiled on 14th November 1933. A.W.E. Wheeler laid a stone in memory of those connected with the Church or Sunday School who gave their lives in the Great War 1914-18. Though the contract price of the Church was safeguarded, by the date of the opening ceremony, through the Building Fund accumulated over many years of saving and special efforts, there were essential extras to complete its scheme. It was necessary to find heating and lighting installations, Pews in American Oak (£216), entrance gates from Carisbrooke Road (£120), pulpit (£31) and finally, the Architect`s fees, covering professional advice and drawings for a period of years. Although the Trustees made an exhaustive search for a higher tender, they were only able to obtain £8 for the old building from a neighbouring owner, who undertook to demolish the structure and remove the materials from the site, after setting aside sufficient stone to repair the boundary walls. Towards furnishing the new Church, however, Mr. Robert (Bob) Colwell, a grandson of the elder Richard, presented a wall clock and pulpit bible, Mr. H.A. Pearce provided the Communion Table and Mr. S.F. Harris donated a hymn number board and an electric heater to sustain the essential role of the Choir in the Church. The Rev. E.C. Raynes continued to preside over, and encourage the gradual equipment of the Church and the layout of the surrounding land until 1931 when he was succeeded by Rev. Walter G. Fowles, who, during his ministry of 6 years, was particularly concerned with the formation of the Tennis Club, to utilise to the best advantage the area northwards of the Church to the Hucclecote Road, and the creation of an Organ Fund, resulting in the building of an organ chamber, and the installation of an organ specially built for the Church, and still giving much pleasure to all who visit it. Directly the congregation became acclimatised to Carisbrooke Road it was generally agreed that yet one more special effort was imperatively necessary to replace the instrument which had seen many years service in the original Chapel with a Pipe Organ more in keeping with the new structure. A small committee was appointed early in 1935, with Mr. Herbert Colwell as Treasurer of the special fund. He chased contributions with characteristic tenacity, the target was reached in 1936, and the actual Dedication ceremony took place, with musical honours on 14th January 1937, when Mr. W.K. Colwell, Organist for over 46 years, unlocked the new organ. Another master stroke in 1929 was the appointment of Mr. & Mrs. Sam Alder as caretakers of the Church and Sunday School, initiating a most meticulous and loyal guardianship of the premises lasting more than 30 years. 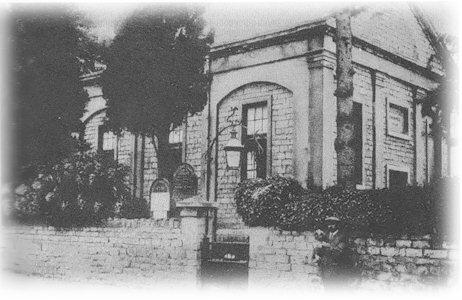 Reverting to the early years of transition of the Church from its original site to Carisbrooke Road, it was arranged in 1931, that the tablet stones from the front of the old building, inscribed "WESLEYAN CHAPEL - ERECTED 1848" should be built into the new retaining wall facing the Burial Ground, and eventually this Chapel was demolished, and any remaining accommodation between the Hucclecote Road and the Old Chapel Cottage, used for burials. Although members of the Church and their near relatives continued to be interred there for nearly 40 years there is now only limited room for small memorial tablets against the boundary walls. Although the small entrance gate now bears a bronze name plate many local residents seem vague about the history of this hallowed plot and the adjoining footpath has been somewhat hazardous in the past, notably when a venerable conifer crashed over the graveyard wall into the main road. From the time when the old Chapel was declared unsafe in 1928, until the onset of acute arthritis Sam Alder tidied the Burial Ground as if it were his own garden, just one of his ever increasing duties as caretaker. In recent years, Phil Bridgeman, always in the forefront of practical helpers, has maintained, as a free-will offering to the Church, the high standard of upkeep set by Sam over this ground. This service by Phil has been combined with work on the News Letter and Focus, assistance at the organ, membership of the Choir and several years duty as Chapel Steward, to put devotion in its true perspective. During the 1939 - 45 war, when stray bombs and ACK-ACK debris tended to fall in the area, the church was fortunate to remain relatively unscathed. It was during the early years of the 1939-45 War that Rev. Cecil Rose took over the ministry at Hucclecote on the untimely death of his friend, Rev. Horace Atkins, and led an enthusiastic local campaign on behalf of the Oxford Group Movement, which undoubtedly had a profound influence on certain members of the congregation. Cecil, as he preferred to be called, was a gentle scholarly man, frequently contributing to "The Methodist Recorder", and other religious publications of that period, more at home in a house group, or college seminar, than the physically more demanding task of an itinerant ministry. In 1942 Rev. Bernard Lewis moved into the Manse and stayed until 1949, our longest serving resident Minister up to date - he was also in charge of Lonsdale Road, and proved very popular with both Churches. Perhaps it was his lightness of touch, especially when operating his invisible acrobatic flea "Freddie", which caught the attention of his audiences. Undoubtedly he had an engaging manner in the pulpit and dramatic talent which captured the allegiance of folk not necessarily regular worshipers. By 1954 Rev. Frank White had come to Hucclecote and was investigating the financial planning prospects of a new building at Carisbrooke Road. However, the occasion of the Silver Jubilee of the opening of the Church on 14th November 1954 provided an opportunity for thanksgiving for the past and appeal for generous provision for the future, at which Rev. Ernest Raynes, resident minister in 1929, conducted the services morning and evening. Although the Rev. White was still suffering the after-effects of war-time internment as a Missionary in China, he was keen to press on with plans for the school and Mr. Egbert Leah, son of Mr. Wm. Leah, Architect of the Church, was requested to provide preliminary drawings for an apparently distant prospect. Yet expansion was in the air - a Publicity Officer, Miss Jean Colburn, was appointed for 1955 - and Church membership first reached 100. The Leaders Meeting has a forward look to, on 2nd June 1955 the possibility of setting up a Boys Brigade Company in association with the Church was accepted in principle. There had been a small Boy Scout Group in earlier days, attending at Carisbrooke Road, but this had faded away some years previously. The sale of the land at the rear of the Burial Ground had been completed by 13 June 1960, after more than 2 years of negotiation and the proceeds would be ear-marked for the benefit of Hucclecote Church Trust. Also, by this time, the New School/Hall Building Sub-committee had adopted a lay-out, for a building to accommodate 250 people at an approximate cost of £8500 to include most of the heating installations. By 17th October 1960 this estimate had increased through inflation, by over 25%, and revised plans had been invited at about £7000. By the end of 1962 it has been hoped that the new School Hall, adjoining the Church, might be opened but this long-expected event took place on 25th May 1963, starting with an Afternoon Service at 4 pm., conducted by Rev. Alan E. Wilde, Superintendent of the Circuit, at which the preacher was Rev. Herbert Simpson, Secretary Methodist Department for Chapel Affairs, the Vicar Rev. N.M. Hughes read the lesson, and Rev. Clifford Cook gave a statement of the background and history of this glad enterprise. Following the conclusion of the service the Clergy, followed by the Congregation, led by Mrs M.A. Cowcher and Mr. Herbert Colwell, members longest associated with the Society of Methodists at Hucclecote, proceeded to the front of the new hall. At that point Mr Leah, the Architect presented the key to Mrs. J. Giles who unlocked the main doors, and the ceremony ended with the Dedication led by Rev. Cook. On the following day, Sunday School Anniversary Services, morning and evening, were conducted by Rev. Frank White, who had been resident Minister, very closely concerned with encouraging this development from 1953 to 1958. Over the years 1964-66 there was much deliberation of the take-over by the County Council of Carisbrooke Road - originally following the track of worshippers to their Parish Church of St. Bartholomew on the far crest of Chosen Hill, from the tiny population of Hucclecote Green. Another boost to morale occurred on 22nd March 1966, especially to the young in heart, if not swift of foot when permission was granted for the use of the Hall by a proposed Badminton Club. This new departure, after teething troubles in its first season has more than filled the void left by the gradually declining Tennis Club of an earlier generation, providing the expertise for decoration and re-decoration of the Hall since 1967, financial contributions to the Church, and a variety of assistance on special occasions, adding considerably to their enjoyment. During 1966-67 the Church voiced its warm appreciation of the tireless service of Mr. Herbert Colwell, as Chapel Steward for 30 years, and of Mr. & Mrs. Sam Alder, as caretakers for 40 years, in their labour of love for the maintenance and improvements of all Church premises. From the retirement of Mr. & Mrs. Alder in 1967 as caretakers there was, virtually a interregnum of several years in this vital service, long fulfilled unofficially, but with immense energy and efficiency, by Mr. W. Young, who had then, and still continues, to perform a variety of essential tasks for the benefit of the Church, with precision unabated. Eventually, also from the membership of the Church, Mr. & Mrs. J. Freebrey volunteered to assist for a trial period, later to become a contract of employment for the performance of manifold duties, from which they have been obliged to retire upon grounds of ill-health. Additional accommodation for Junior Church was a tonic much in the minds of Leaders and Trustees Meetings in at least 5 years from mid 1969. Sunday School conducted in the Thomas Gaze Memorial Hall from 1929-1964, and re-christened Junior Church, over-flowed the Hall in Carisbrooke Road, shortly after it was opened, and the "Old School" - later pronounced "The Pop-In" - became the refuge of older young persons. With a different style of teaching, and a demand for more visual aids and improve amenities generally the staff of Junior Church coping with increased numbers, especially of Primary children, were at their wits end for adequate space. In September 1975 Rev. Gillett, who had charge, also of Churchdown, another growth area, transferred to the South Coast, whilst Rev. Alan Taplin, Mrs Taplin and their sons came from Yorkshire to Hucclecote, where one of his first duties was standing in a moment of silence, as a mark of respect for Sam Alder, whom he had never met, but whose memory remained undimmed with those who could recall his protective care of all Church property. Alan was a Minister who is a good "all-rounder", with every age in our community, a welcome visitor, interested in music and sport, and pageantry, an acceptable preacher, with a touch of humour in a direct message. Since his arrival in 1975 there has been a far greater demand on his time at Hucclecote than in the case of his predecessor. The fine work of David and Rosemary Gregory and the Officers of the Boys and Girls Brigade who have joined them, has built up a force of young people, not to mention their parents, which has made its presence felt both within and outside the Church. The Day Centre, a more recent influence, has provided a service for the disabled which definitely stirred the Parish at Brockworth to provide a similar amenity and has encouraged several handicapped people, through the kindness of helpers, to join us in Sunday Worship. Finally, do not forget the Choir, no longer a family business, but under the direction of Geoff. Spence, still fired with the enthusiasm of the Colwells in the Old Chapel, and in time with the quartet of Volunteers, rotating in the organ loft. In 1990 the Boys Brigade decided to lay a wreath at the War Memorial on the corner of Green Lane. Each year the number of organisations and people of the village taking part has increased, becoming an annual gathering of people of the village. In October 2000 the memorial was rededicated after being refurbished. The memorial was unveiled by Connie Casey (aged 86) who`s mother had unveiled the original memorial eighty years previously. The service was attended by members of the Boys and Girls Brigades, Scouts, Guides, The Hucclecote Community Association, Parish Council and people from the village as well as the Royal British Legion. During 1997 the Boys Brigade Company celebrated their 25th Anniversary with a reunion of old members which included David and Rosemary Gregory the first Captain of the Company, and Rev Alan Taplain and his wife Joyce. This was followed by a parade service on the Sunday morning conducted by Rev David Gregory and Rev David Meachem. The following year in October 1998 the Girls Brigade also celebrated their 25th Anniversary with an Anniversary Weekend. In 1998 Plans were put forward for the building of a link between the Church and School Hall. This was agreed by Church Council, and also the Church Family at a General Church Meeting and fund raising to cover the cost of £105,000 began. Events such as an Antique Roadshow, Flower festival, May Fayre, Christmas Dinner and numerous small events by members of the church family were organised. Building was started in 1999 with the opening and service of Thanksgiving on 15th April 2000. The Building has become known as the Welcome and has given the church an added facility for providing its outreach into the Community. By the time of the opening the building had been paid for with a grant of £40,000 from the Environment Agency. At the same time some of the pews were removed from the front of the church and replaced with chairs and a dais was built with a removable Communion rail made from the old pews giving an area to improve the worship potential. Also during 1999 a tapestry was started to mark the millennium by some of the ladies in the church. It was used as part of the fund raising for the Welcome Area whereby people were invited to add a stitch to the Tapestry. This can be seen hanging in the link between the Church and the welcome.